The Future Ready framework identifies transformative budgeting as a viable strategy for smart, innovative budgeting to provide equitable, personalized learning for all students. 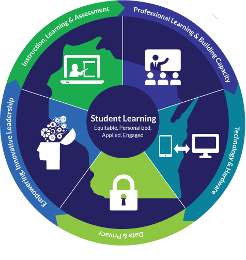 Many Wisconsin school districts are using the assessments, reports, strategies, resources, and planning templates on the Future Ready dashboard aligned to the Wisconsin Digital Learning Plan, the Budget and Resources Gear is outlined below. The district Future Ready Dashboard tool includes a separate Budget and Resources dashboard gear (gear assessment questions ) to allow districts to leverage data to drive their collaborative leadership decision-making. The transition to digital learning will require strategic short-term and long-term budgeting and leverage of resources. All budgets at the district and the school should be aligned to the new, equitable, personalized vision for learning, with consistent funding streams for both recurring and non-recurring costs to ensure sustainability. During the transition, district leaders should strive for cost-savings and efficiencies through effective uses of technology. Future Ready notes that the financial model should include the metrics and processes to ensure not only sustainability but also accountability for learning returns on investments. The elements that comprise this Gear are listed below along with a description of the Gear and a continuum of progress with levels of readiness. Innovative funding for digital learning is needed to leverage technologies to improve teaching and learning as well as to increase efficiency and cost savings. A cross-functional District budget development team should be formed that is composed of District leaders, key stakeholders, and subject matter experts who collectively represent the District’s interests. This team employs strategies for calculating the total cost of ownership (TCO) for all technology resources; focusing on learning-enabling technology, digital resources, and instructional practice. To what extent are the district’s expenditures for digital learning efficient, effective? Has the district achieved any real cost savings through the use of technology? How proactive is the district in seeking out and implementing cost-saving models? Priorities for budget and resources are clearly linked to the district- and building-level strategic and tactical plans and to continuous improvement goals. All expenditures must be justified as supportive of these plans. Innovative programs are funded conditionally upon their alignment with the district’s vision and mission. To what extent are the district’s budget priorities aligned with the district’s vision for digital learning to help close achievement gaps and promote equitable, personalized learning for all students. The District has consistent and flexible funding that enables equitable access to optimal learning environments. Budgets for technology-enabled learning tools and resources are addressed in short and long-term fiscal plans. Funding sources are identified in the District’s annual maintenance and operation budgets with minimal reliance on grants or other temporary sources. Funding for digital learning is integrated across multiple budget areas where appropriate. Does the district have a clear strategy for using recurring and non-recurring budgets to ensure a consistent funding stream to support digital learning? Is the district implementing this strategy? All metrics for review of budget priorities and cost-efficiency are based on their demonstrated relationship to student learning goals. District leaders have strategies and tools for measuring Return On Investment (ROI) in digital learning; focusing on learning-enabling technologies, resources, instructional practice and student learning. To what extent has the District shown an academic return on investment for expenditures for digital learning that help promote equitable, personalized learning opportunities to ensure all students are College and Career Ready?